Ultrasonic non-destructive testing automation and digital control ensures reliability, increases the speed of testing, and allows 2- and 3-dimensional images to be acquired. However, the wide range of ultrasonic signal amplitudes and the frequency are increasing the requirements for equipment used for inspection. The common instrumentation used for NDT usually cannot satisfy this. Although ultrasonic NDT is popular for inspection of composite materials, application to certain types of composites produces unsatisfactory results if conventional methods are used. Reinforced aluminum matrix composite is a very high attenuation material. High resolution imaging, using high frequency signals and sharply focused transducers is therefore not possible. If lower frequencies are used, there will be problems with both poor axial and lateral resolutions and structural noise still remains. Multilayered composite plates are widely used in many advanced industries for their properties. One of the pivotal problems still remains efficient detection and characterisation of delaminations occurring in multilayered thin composite plates, the thickness of which is less than the spatial length of the ultrasonic pulse. Limited bandwidth of a commonly used ultrasonic testing equipment distorts the information about delaminations so these are not easily detectable. Two different techniques have been developed for detection and characterisation of the delaminations in thin multilayered composite materials using band-limited ultrasonic signals acquired by commercially available instrumentation. apply the new method to experimental data. obtain approval of experimental method. development of suitable processing algorithms for delamination inspection. The adaptive gain control (AdGC) algorithm developed permits reconstructing high quality ultrasonic images of the objects with a very wide range of received signal amplitudes even using low resolution A/D converters. Additional benefits exhibit themselves in the case of more sophisticated image processing and routine inspection. 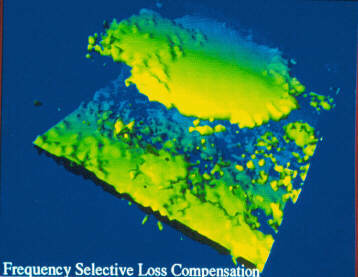 A new, frequency selective loss compensation (FSLC) method was developed and experimentally verified, allowing the inspection of high attenuation composite material with high structural noise level. It gives the SNR and resolution enhancement thanks to the use of FSLC. A reliable method for delamination inspection of thin laminates was developed, based on differential signal extraction (DSE). The major achievement of this method is that time domain information is sustained: the method can resolve the layer at which the delamination has occurred. As mentioned before, the ultrasound is interacting with the specimen at material structure level. This allows one to extract material macrostructure properties which are of major interest in NDT. But due to the finite physical size of the ultrasonic beam, relatively narrow inspection pulses are blurring the obtained data, i.e., the measured properties are smeared over a particular area. Also the existing equipment is not capable of producing an ideal delta pulse. This is also a degrading factor for obtained image quality. The goal of the investigation is not always detection of all inhomogeneities in a material. For instance, composite materials which are used more and more, have inherent inhomogeneity due to their structure. Nevertheless, it is desirable to obtain the differences in mechanical properties for those materials. In that case structure born signals are considered as noise. The extraction of defect information in such inhomogeneous structures was the aim of this work. All the factors mentioned degrade the measurement results. Usually, results are presented as 1-, 2- or 3-dimensional images. Therefore it is frequently said that image quality is corrupted or blurred. All the algorithms mentioned are dedicated to increasing image quality which has been degraded by all the factors mentioned. There is no unique algorithm, capable of fighting everything at once. Every algorithm is dedicated to solving one of the problems. Sometimes it is even necessary to sacrifice some signal properties in order to gain others. Here is the list of known image processing methods investigated and employed in this thesis: Inverse filtering, Wiener filtering, Autoregressive spectral extrapolation (ASE), Split spectrum processing, Synthetic aperture focusing technique (SAFT), and Ultrasonic spectroscopy. Figure 2.1. Time diagrams illustrating the adaptive gain adjustment (SNR=80dB): gain of the controlled amplifier (top); actual (solid line) and predicted (grey line) signal amplitudes at the amplifier output (central); restored MaxPlot signal (bottom). where URi is the actual value of the signal given in a floating point representation, UMi is the nA/D bits representation of the signal after A/D conversion, and n is the number of measurements performed. Such an evaluation of the error allows us to see the advantages of the adaptive gain adjustment. The efficiency of the different gain control algorithms can also be evaluated assessing the time needed for the calculations (presented in thesis). Figure 2.2 Relative errors of different control algorithms: iterative gain adjustment; adaptive gain adjustment with prediction; gain adjustment without prediction; logarithmic amplifier. Index 8 stands for 8 bit A/D converter, 6 - the 6 bit A/D. The application of the algorithm on data acquisition showed good performance of adaptive gain control. Great improvement of the images is obtained if adaptive gain control is used in the case of a relatively high SNR. This is illustrated in Figure 2.3 and Figure 2.4 by the images of a point-type reflector, located beside a large, flat reflector, obtained by adaptive and conventional acquisitions. Image (SNR=60dB) restored by SAFT after the adaptive data acquisition: MaxPlot image (left), B-scan image (right) Figure 2.4. 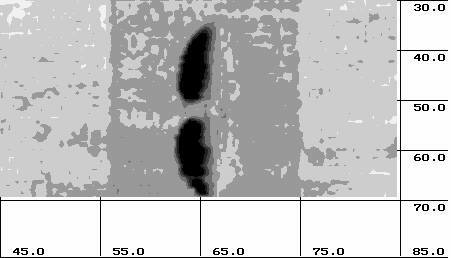 Point-type reflector image restored by SAFT after conventional data acquisition: MaxPlot image (left), B-scan image (right). We can see that adaptively-coded data yield better results. The differences between conventional and adaptively acquired images increase in the case of A/D converters with a smaller number of bits. An adaptive imaging algorithm for ultrasonic NDT purposes results in significant compression of the dynamic range of the received ultrasonic signal, so high quality acoustic images can be obtained even using 6-8 bit high speed A/D converters. The hardware needed to realise this method includes an amplifier with a computer controlled gain factor. All other operations are performed by software. The simplicity of the method described can be used to modify any conventional 2D acoustic imaging system. This was implemented on the IZOGRAF-3 acoustic imaging system. The main advantage of the technique proposed is the possibility of obtaining a B-scan image during a single scan of a transducer without a priori detailed knowledge about the expected range of ultrasonic signal amplitudes. This feature is of great importance when NDT is performed in a dangerous environment. It is necessary to point out that it is similarly possible to compress the dynamic range of C-scan images. The compression of dynamic range is performed without a loss of information, becausethey are represented independently of the absolute level of the input signals in the buffer memory with the same relative accuracy. The actual signal level can be restored from the gain factors stored in computer memory. This is equivalent to the digitisation of the signal with more bits than are available in the A/D converter used. Therefore, this algorithm has additional advantages in the case of advanced acoustic image post-processing. Although ultrasonic imaging is popular for visualisation of defects within composite materials, its application to certain types of composites produces unsatisfactory results if conventional methods are used. One material for which 'special' techniques have to be developed is high volume-fraction carbon fibre reinforced aluminium matrix composite. This is a very high attenuation material (with an attenuation of 3.8 dB/mm at 5 MHz). High resolution imaging, which would require using high frequency signals and sharply focused transducers is therefore not possible. If lower frequencies are used, there will be problems with both poor axial and lateral resolutions. There is also the problem of high structural noise due to scattering from the fibres, even at the lower frequencies. In this thesis we report the application of the well-known split-spectrum processing method (SSP) to the anisotropic composite and show that it reduces much of the structural noise. Improvement of the axial resolution is demonstrated using a novel application of Wiener filtering and Autoregressive Spectral Extrapolation (ASE). Both these techniques applied in the conventional sense would be unsatisfactory in the case of this high loss material, because of the difficulty in obtaining a suitable reference 'wavelet'. With a new approach to attenuation compensation and judicious application of Wiener filters to 'split-frequency' signals, we will demonstrate not only an improvement in the axial resolution but also in the structural noise level in images of defects in this composite material. 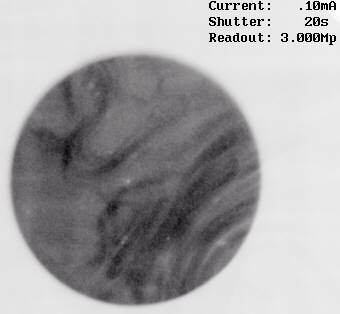 The fragment of an X-radiograph of the test specimen is shown in Figure 3.1. a. This specimen is an aluminium-6082 matrix composite with 43% volume fraction of low modulus, long carbon fibre reinforcements in a [0°,90°] lay-up. The thickness of the plate is 12mm. The flat-bottomed holes have three different diameters and are at four different depths from the surface. These holes were used for establishing the performance of the imaging system, before and after signal-processing. The figure demonstrates the 10mm diameter, 10mm depth hole. Figure 3.1 b presents the 3-dimensional image obtained after the new processing scheme. The X-ray (left zoom) of an Al-C metal-matrix composite sample and the output image of the new processing method ( right zoom). Before the holes were imaged, it was necessary to obtain the attenuation versus frequency characteristics of the specimen. The usual method for measuring attenuation in a plate is to look at the ratio of consecutive backwall echoes. 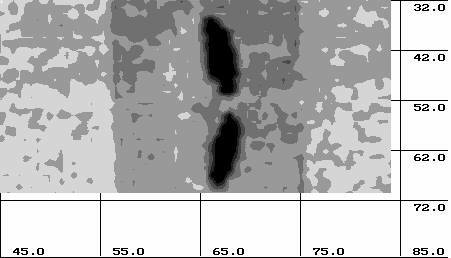 But since the attenuation in this specimen is very high, only one backwall reflection is measurable. Therefore a special through-transmission arrangement was employed which is explained in the thesis. 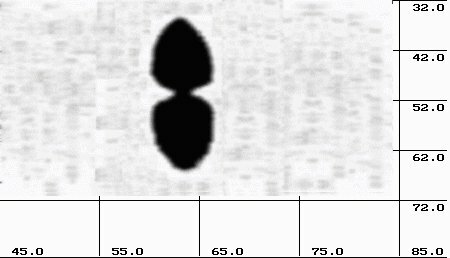 The attenuation information a(f) was used to choose the best transducer frequency range within which the images were obtained. Two improvements to the signal quality are needed, before the B-scan or C-scan image is constructed from the processed A-scans. The first is an SNR enhancement to be achieved by split-spectrum processing (SSP), and the second is a depth resolution enhancement to be obtained by Wiener filtering (simplest case). The effectiveness of Wiener filtering depends on the correct choice of the reference wavelet. This is also true for ASE because it uses a Wiener filter as the first stage. For high loss materials no suitable reference wavelet can be found, as explained earlier. A new approach is presented here whereby loss compensation is applied to the signals in such a way as to make the use of Wiener filtering more effective, at the same time delivering all the benefits of SNR enhancement obtained with SSP. Transformation of the signals to the frequency domain by FFT completes the compensation process. With both the split signal and the split reference wavelet correctly compensated for the effect of frequency dependent attenuation, a Wiener filter is applied to each split signal before the resulting deconvolved signal is transformed back into the time domain. spt is an output signal at the time instant ti. Averaging and polarity is performed in the same manner. The FSLC process is expected to make the performance of the Wiener filter less sensitive to the choice of the reference wavelet. This should enable one to use the front face echo as the reference r(t) and still obtain a sharpening of a deep defect echo. In order to prove the stability of the FSLC method and have a better presentation of what the defect looks like, 4-dimensional data was collected (x,y,t and amplitude). Using a standard -6dB threshold, a 3-dimensional isosurface of the defect image was created (Figure 3.1 b). The image correlates with data obtained using X-rays of computed tomography (results presented in thesis). A new signal processing scheme for ultrasonic imaging of high loss composite structures incorporates FSLC and Wiener filtering within a split-spectrum processing algorithm. It was shown that this approach greatly enhances the SNR and improves the depth resolution for images obtained in a specimen of high acoustic noise level. In comparison with other signal processing methods it showed the best performance. The good performance of the algorithm can be explained by time-frequency dependent signal components and proper correction by FSLC, both of which contribute to good SSP algorithm performance. Split windows contribute to a better fit of the reference wavelet and signal in inverse filtering. All the factors mentioned combine to produce an amazing performance. The results inquiry with X-ray CT gave a good match on results. Multilayered composite plates are widely used in many advanced industries due to better reliability and lower cost. One of the pivotal problems still remains efficient detection and characterization of delaminations occurring in multilayered thin composite plates, the thickness of which is less than the spatial length of the ultrasonic pulse. Due to limited bandwidth and nonlinear phase response of commonly used ultrasonic testing equipment, pulses reflected from composite material are so significantly distorted that the information about delaminations for the operator is almost completely lost. We introduce signal processing algorithms enabling efficient detection and characterisation of delaminations in thin multilayered composites using band-limited ultrasonic signals acquired by commonly used ultrasonic instrumentation. Particularly, the algorithms exploiting the modified L1 norm deconvolution and frequency domain imaging are analyzed. The algorithms were tested both on simulated and real signals. For this purpose a simplified 1D mathematical model based on a 4-pole matrix approach was developed and experimentally verified. Comparison of the simulated and experimentally obtained results revealed the possibility of determining the character of the delamination occurring in layered laminates. The specimen used for this purpose was an ARALL type 3 layer composite plate with an unidirectional glass fiber reinforced prepreg between two aluminum 7075-T6 layers. The acoustical and geometrical parameters correspond to those used in calculations. The composite plate contained an artificial delamination which arose during a fatigue test around the hole drilled through the specimen (Figure 4.1). All experiments were carried out using the ultrasonic imaging system IZOGRAF-2 in pulse-echo mode with 20 MHz sampling frequency and 8 bit data conversion. The composite plate was immersed in water and located 40 mm from the 5 MHz ultrasonic focused transducer corresponding to its focal distance. Ultrasonic data acquisition was performed from two opposite sides of the plate in order to reveal the differences in the obtained images. The images cover a region 40x40 mm around the hole drilled in the center of the plate. In order to prevent water penetration inside the delamination at the vicinity of the hole, the crack opening was covered by Scotch tape stuck to a surface of the sample. For reduction of the influence of electrical and quantisation noise received pulses were averaged. The image of the same sample but produced using through transmission technique is displayed in Figure 4.1 right. The dark object in the center represents the delamination lateral configuration. This result can be trusted, because through-transmission is a reliable method, widely used in practice. Also, a 15mhz frequency was used, which is 3 times the frequency we are planning to use for our investigation. Also, an 0.1mm step was used to acquire the image. The rest of the investigation was performed with a 0.6-1.2mm step. The raw image for pulse-echo investigation has a rather low signal/noise ratio and does not allow us to determine reliably either the geometrical shape or the depth of the delaminations. The well known L1 norm processing was modified in order to extract necessary features from the data. The results presented indicate that the proposed filtering and image formation procedures enhance the images significantly. As should be expected, C-Integral scan images possess better SNR than C-MaxPlot scan images. After compression of the filtered A-scans into one point of the 2D image the spatial resolution along z-axis is lost, but still enables us to see differences between delaminations on the opposite sides of the hole. That can be achieved by collecting data from two opposite sides of the plate and displaying the obtained filtered C-type images. For example, the top view displays the flaw only on the left side (Figure 4.2 left) and the bottom view only on the right side of the hole (Figure 4.2 right), which allows us to suggest that they are located between different layers. In other words, disruption has occurred between different layers on the left and the right side of the hole (Figure 4.3). The image shown in Figure 4.2 is obtained using a modified algorithm, which exploits the residual part of L1 norm deconvolution's first iteration. C-Integral image after iterative front face subtraction. and "bottom" (zoom right) side. A similar result to L1 norm deconvolution can be obtained by displaying not the differential pulse response, but the residual part of the reflected signal , which is determined by subtracting from the reference signal , reflected by a flawless region, the pulse , received at the delaminated area. The reflection from the flawless region was used here to deconvolve with instead of the reference wavelet. In such a setup the residual part even gains the differences between the delaminated and flawless areas. After such a transformation a spatial resolution along z axis is lost, but by presenting images at various frequencies it is possible to govern a spatial resolution in x,y plane and to extract different information about disbonds located at different distances from a sample's surface. That allows us to obtain both sides' delamination images from one side. C-scan of frequency domain at 3.75mhz after iterative front face subtraction (left). Right picture presents the interpretation of investigation results. Both techniques, especially the second one, work as feature extraction procedures, revealing differences between pulses reflected by flawless and delaminated regions and in our opinion are not limited to the case of 3 layer composite plates. Two different techniques have been developed for detection and characterisation of the delaminations in thin multilayered composite materials using band-limited ultrasonic signals acquired by commercially available instrumentation. The first technique exploits the modified L1 norm iterative deconvolution and allows us to distinguish between the disbonds at different depths. The second technique is based on a spectral analysis of the residual part of a reflected signal L1 norm deconvolution. In both methods the masking effect of the band-limited strong frontal echo is significantly reduced, showing the advantage of the methods. The parameters required for proper method performance can be determined using the simplified 1D model, based on a four-pole theory and a matrix calculation. In spite of the simplifications made, the experimental verification demonstrated that the model is consistent with reality. An adaptive imaging algorithm for ultrasonic NDT purposes has been developed. It results in significant compression of the dynamic range of the received ultrasonic signal. The main advantage of the technique proposed is the possibility of obtaining a B-scan image during a single scan of a transducer without a priori detailed knowledge about the expected range of ultrasonic signal amplitudes. This feature is of great importance when NDT is performed in a dangerous environment. The algorithm has additional advantages in the case of advanced acoustic image post-processing, for instance SAFT. Svilainis L., Dumbrava V., Puodziunas V. Digital AGC in ultrasonic imaging systems // Resp. konf. "Ultrasonic measurement and diagnostics in industry and medicine" proceedings.- Kaunas,- 1989.- P.5-6. Kazys R., Dumbrava V., Svilainis L., Mazeika L., Puodziûnas V., Eidimtas N. 3-D digital ultrasonic imaging system for NDT applications // Proc. of higherschools of Lithuanian Republic, Ultragarsas, 1991, vol.23. ,P.57-72. Kazys R., Dumbrava V., Svilainis L., Mazeika L.. Digital ultrasonic imaging system : the software concepts // Informatica, 1991, Vilnius, Mokslas, vol 2, Nr.4,P.477-495. Svilainis L., Dumbrava V., V.Puodziunas et al. Software for ultrasonic NDT systems. // Proc. of higherschools of Lithuania, Ultragarsas, 1992, vol.24. N.Vaitkus, L.Svilainis, V.Dumbrava . General purpose scanning unit for NDT ultrasonic systems // Proc. of h.schools of Lithuania, Ultragarsas, 1993, vol.25. P.88-97. Kazys R., Svilainis L., Dumbrava V. Investigation of adaptive imaging algorithms for ultrasonic NDT // Radioelektronika, 1993.-T.29.-Nr.2., P.156-168. Kazys R., Svilainis L. Analysis of adaptive gain-control algorithms for ultrasonic non-destructive testing. Report No:LiTH-ISY-R-1596. University Linkoping. 1994. P.1-67. Svilainis L., Saffari N., Mahlouji H.. Signal processing for ultrasonic imaging of composites. Conference proceedings. Bentham Press, London. 1994 P.138-153. Kazys R., Svilainis L. Analysis of adaptive imaging algorithms for ultrasonic non-destructive testing. Ultrasonics 1995. Vol 33, No1. P.19-30. Svilainis L. Ultrasonic non-destructive testing system IZOGRAF. Report No: LiTh-IKP-R-866. Linkoping university. 1995. P.57.